Playing around with pomegranates and ways to use them, has led me to exploring Lebanese and Middle Eastern food over the Christmas break. 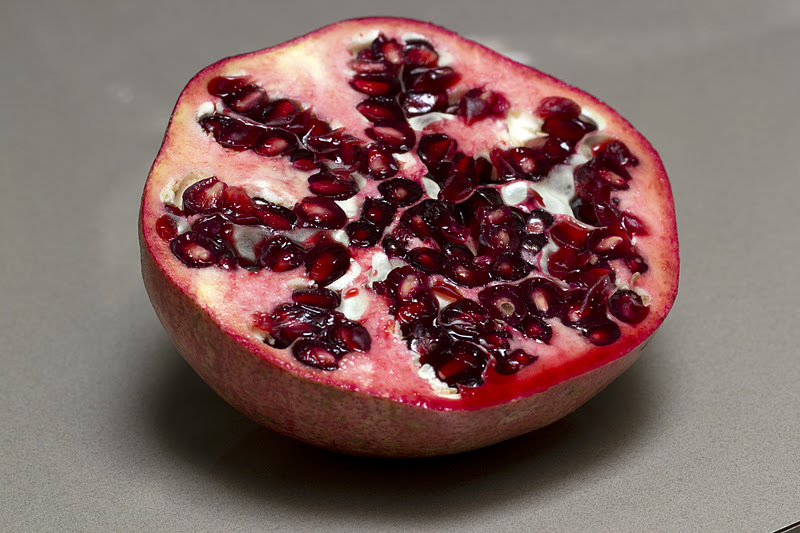 I will post some recipes shortly that feature pomegranates and some other ways to use leftover Christmas food!! What to do with the mountain of food left overs from Christmas Day is always tricky, especially when the ravenous appetites have been sated by the excesses of the last few days. No one wants to hear the words ‘turkey’ or ‘ham’ ever again. I usually freeze what I can or gradually use them in dishes that are cleverly disguised as something else. You might be surprised when a few tasty sauces or dressings are added how appetites can return. Both of these dishes are a complete meal in themselves, alleviating the time spent in the kitchen. 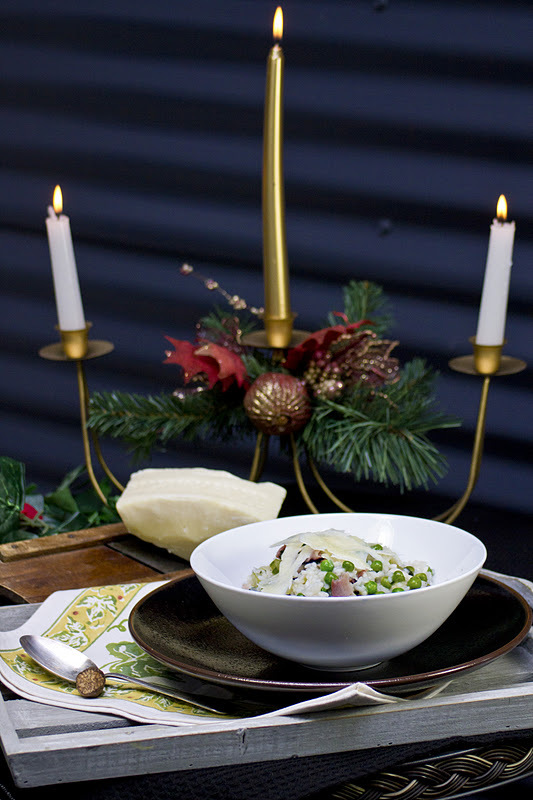 The risotto is served warm, although it can be prepared in advance and reheated in the microwave oven. Risotto ingredients are generally on hand found in the pantry. Slice the green part of the shallots into long thin strips. Chop the white parts of the shallots and set aside. Heat the oil in a shallow frying pan and fry the sliced green part of the shallots until they are crisp. Remove and drain on paper towel. Boil the potatoes for 10 minutes, or until just tender when pierced with a pointy knife. Drain and allow to cool, then cut in halves or quarters. Cut the unpeeled apple into thin wedges and immediately toss with lemon juice to prevent discolouring. Boil or microwave the zucchini until tender, then drain and refresh in cold water. 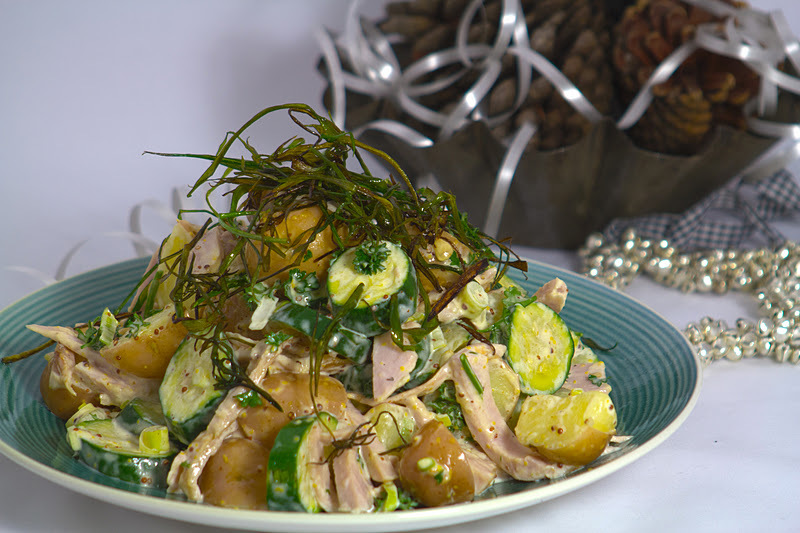 For the dressing, stir the ingredients together in a small bowl, then season to taste. Cut the leftover cooked turkey meat into thin strips and put in a large bowl. 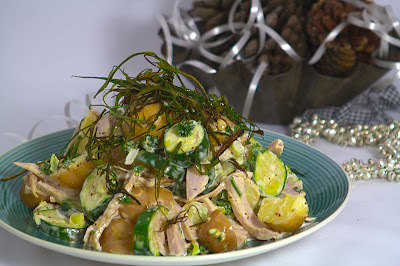 Add the potato, white sliced shallot, apple, zucchini, parsley, nuts and pepper and drizzle the dressing over the top and gently toss until well combined. Serve topped with the crispy fried shallot. Heat the oil in a frying pan, add the celery, parsley and some freshly ground black pepper and cook, stirring, over medium heat for 2 to 3 minutes to soften the celery. Add the ham and stir well. Add the peas and half the wine, bring to the boil, then reduce the heat and simmer, uncovered, until almost all the liquid has evaporated. Set aside. Put the stock, remaining wine and 3 cups of water in a separate pan and keep at simmering point. Melt the butter in a large heavy-based saucepan. Add the onion and stir until softened. Add the rice and stir well. Gradually stir in the hot stock mixture, ½ cup at a time, making sure the liquid has been absorbed before adding more. Stir constantly over low heat with a wooden spoon, until all the stock has been absorbed and the rice is creamy and tender. This will probably take about 25 minutes. Season to taste. Add the pea mixture and grated Parmesan to the rice and serve with Parmesan shavings and black pepper. First published Canberra Times 14 December 2011. Place the eggs and sugar into a heatproof bowl. Place bowl over a pan of barely simmering water and whisk the egg and sugar mixture constantly until the sugar has dissolved. Add the lemon and cumquat juice, lemon rind and butter. Whisk mixture for 20 minutes until smooth and the butter has melted and thickened enough to coat the back of a wooden spoon. Do not allow the mixture to boil as it will split. Pour the mixture into hot sterilised jars and seal immediately. The curd will thicken when cooled. Mix the flour, salt, baking powder and spices together in a bowl. In the bowl of an electric mixer beat the butter until creamy. Add the sugars and beat until well blended, about 2 minutes. Turn the mixer to low speed and add the dry ingredients in 3 lots, mixing until just combined and the flour disappears into the soft dough. If the dough is too dry add a couple of dashes of milk to the mixture, this will vary depending on the weather. You may have some flour at the bottom of the bowl, just mix with your hands to knead the dough and work in any dry spots. The dough will be very soft. Divide the dough in half. Working with one piece of dough at a time, roll the dough between two sheets of baking paper or plastic wrap until you have a circle that’s about 3mm thick. As you roll, turn the dough over a couple of times and pull away the paper of plastic so you don’t end up with creases in the rolled out rounds. Put the rolled out rounds of dough on a tray and refrigerate for at least 3 hours. At this stage the dough can be left in the refrigerator for 3 days or frozen if sealed with plastic wrap for up to 3 months. When the dough is ready to bake, preheat the oven to 180C. Line a baking sheet with baking paper. Remove the dough circles from the refrigerator and peel off the paper or plastic wrap. Using a biscuit cutter, whatever shape you like, to cut out as many biscuits as you can from the dough, carefully lifting the cut-outs onto the baking sheet. Collect the scraps and set them aside to combine with the scraps from the second piece of dough. Bake the biscuits for 8 to 10 minutes or until they are lightly golden and just brown around the edges. Allow the biscuits to rest on the baking sheet for a few minutes before transferring them to a cooling rack. Repeat with the second round of dough. Use the remaining scraps from the dough circle, press them together, and roll them into a circle, chill before cutting and baking as per the previous method. Preheat the oven to 160C. Spread the pecans on a baking tray and bake for 10 to 12 minutes. Tip onto a chopping board to cool, then roughly chop. Cover the baking tray with baking paper. Put the eggs and sugar in a bowl and beat with an electric mixer until pale and creamy. Sift the flours into the mixing bowl and add the nuts and ginger. Mix to a soft dough, then place all the mixture on the tray and shape into a loaf. This should measure about 9 x 23 cm. Bake the loaf for 40 minutes, or until lightly golden. Transfer to a wire rack to cool for about 20 minutes, then carefully cut into thin slices. This is best done with an electric knife, but can be also successfully done with a large serrated bread knife by hand. The loaf will be crumbly on the edges, so work slowly and hold the sides as you cut. Arrange the slices on baking trays and bake again for about 10 minutes each side. They will dry further as they cool, and ensure they are completely cool before storing in an airtight container. It’s believed the tradition of exchanging gifts at Christmas time began with the story of the Three Magi who offered the Christ child frankincense, gold and myrrh. Since then, giving has worked its way into many stories. Across Europe St Nicholas and his friends were known for their charity and gift giving and the tradition of giving gifts started in their honour in the thirteenth century when French nuns gave presents to the poor children. The day for giving was December 6 and pronounced as feast day. This day is still celebrated in Europe but the traditions of gift exchanging and feasting are more likely to occur on Christmas Eve or Christmas Day. It sounds like a good story to me. So to celebrate Christmas and the tradition of feasting, I usually make gifts of food and start on this couple of weeks before Christmas. 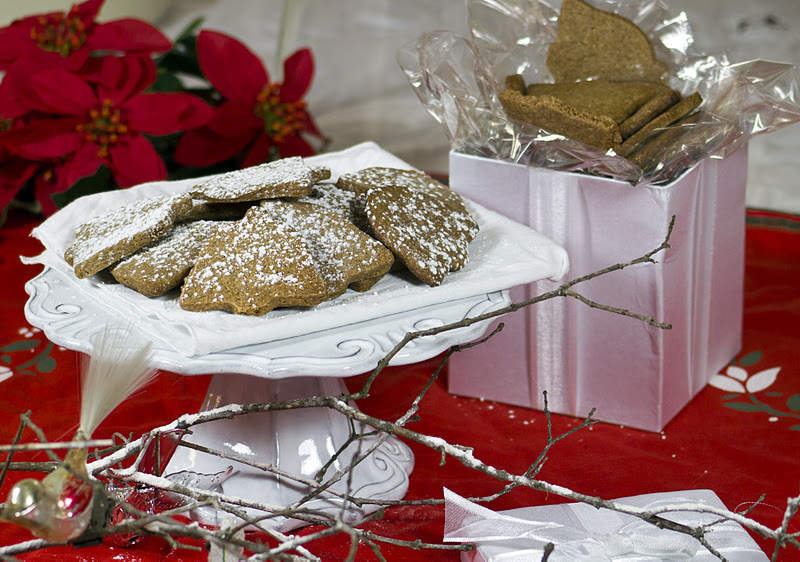 This year, I included traditional Dutch Speculaas in my collection of cooked gifts, which keep well or get better with age. All you will need is an airtight container to store the Speculaas in to keep them from going too soft in the summer humidity. Apart from them being delicious with coffee or tea, these crispy and spicy biscuits can also be used as wafers to sandwich ice cream together as an easy summer dessert. Some preparation is needed when making the dough, which needs to be chilled for 3 hours. 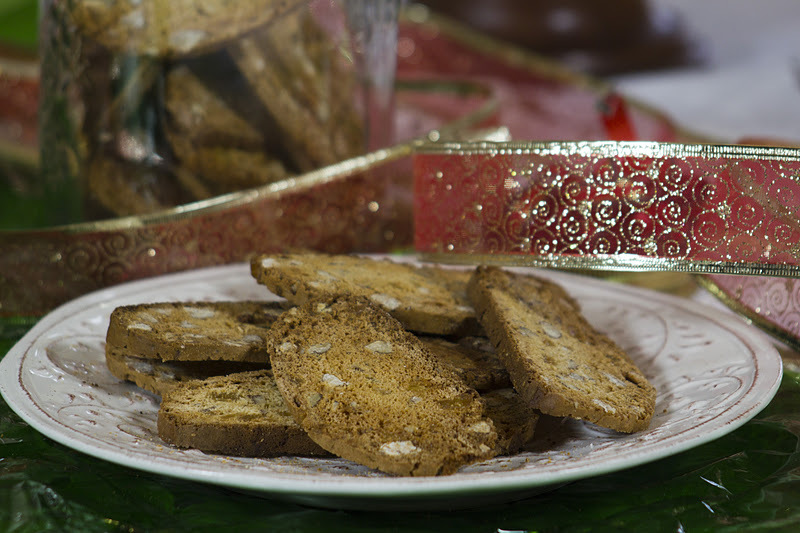 To end a meal or to accompany coffee, I also made Italian Biscotti. These are always gratefully received as gifts, and again, keep for a long time in an airtight container and work well with ice cream as wafers. However, their perfect match is alongside a strong coffee. They take about half an hour to bake and if sliced very thinly you will get about 30 pieces out of the recipe. 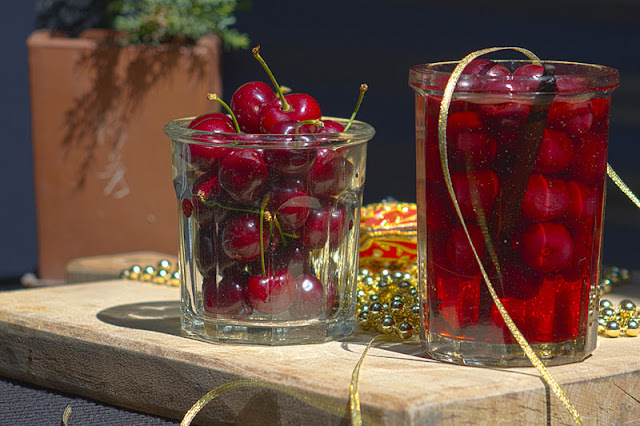 If Christmas cheer is more your thing, the French Cherries in Vanilla Brandy could be your special gift. You still have time to put down a couple of bottles to cure before Christmas. We are fortunate living in Canberra, with access to such quality fresh cherries. 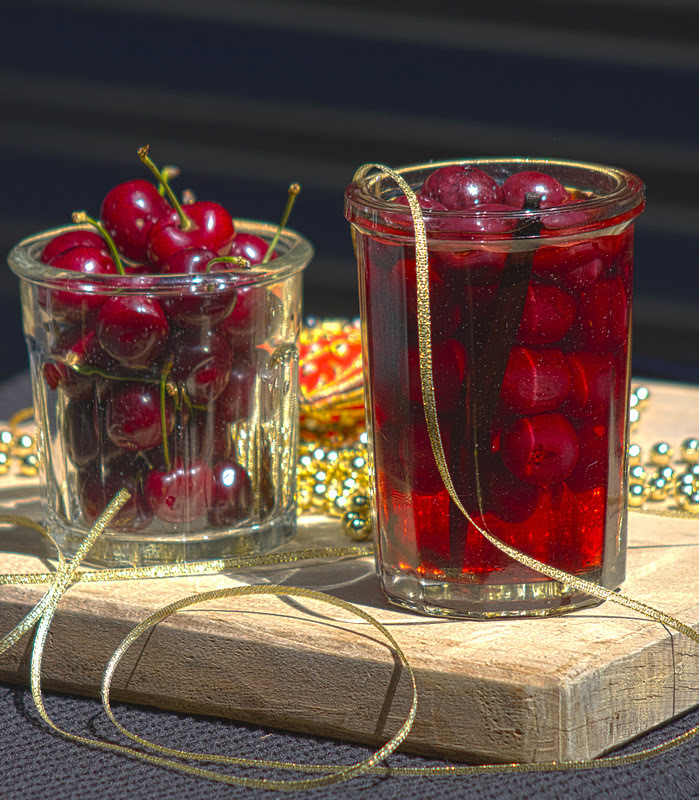 When I was making these cherries in brandy, the smell floated right through the house and I was sorely tempted to keep a bottle aside for myself. Because they need a few weeks to develop their flavours, if you are giving them as a gift, hand write a little note to go with them indicating when they will be at their best. The quantities in the recipe fill about a 1 litre jar or divided the quantity between smaller jars. 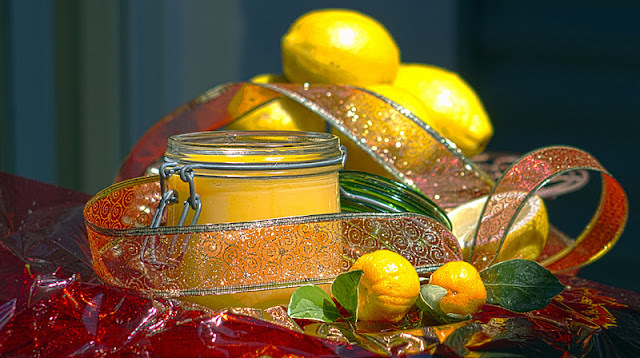 Lastly, as a tribute to an Aussie Christmas, I made Lemon and Cumquat curd. This is great to spread on bread or toast, but it is also really lovely when added to whipped cream or mascarpone to have with desserts or fruit. Recipes are on the following pages. Prick the skins of the cherries with a fine skewer and heat the sugar with the brandy and water in a pan, stirring until all of the sugar has dissolved. Add the cherries and a vanilla bean and heat until boiling. Place the cherries and syrup in a heatproof, warm, sterilised jar, seal while hot and turn upside down for 2 minutes. (you can sterilise the jars by either boiling them in a large pan of water or pouring boiling water over the jars and lids and allowing to dry turned upside down on a rack.). Store the filled jars in a cool place for 6 weeks, turning every couple of days for the first 2 weeks. 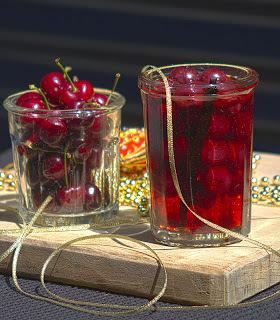 Serve the cherries in the liqueur. Refrigerate after opening. Po of Masterchef has done one like it, so has Maggi Beer. I think Maeve O’Meara has created one as well. You might have guessed, it’s the boiled orange cake. Or in my version, boiled orange and lemon cake. This is slightly different to the original, adding lemon for sourness. This cake is based on a classic Middle Eastern recipe where almond meal and citrus fruits are abundant and form the basis for the ingredients. This is an interesting recipe, as the structure of the fruit changes by boiling it whole, reducing the bitterness produced from the skin and pith. It’s a modest looking cake, even rustic, that packs a huge punch with its strong citrus flavour that lasts in your mouth long after it’s gone. The recipe became popular many years ago by the well known cook and author Claudia Roden when it was published in her A new book of Middle Eastern Food back in the late 1960s. The classic Italian Olive Oil cake is a similar version that uses this technique, although I am not a fan of the strong olive flavour. This classic cake has recently re-emerged and now makes regular appearances on café and bistro menus. I think it is one of my favourite food finds for the year, because of its unexpected flavour and the need for limited use of utensils, as it’s completely prepared in a blender. This is a cake that improves with age and retains its moist texture without drying out. You do need to prepare this cake in advance in order to cook the citrus fruit for 2 hours. If you don’t allow this time, the skin on the fruit will still be bitter. I like to cook the fruit the night before, having the fruit cooled and when I’m ready to bake the cake the following day. After making this cake regularly, I recently experimented with the recipe and substituted a lemon instead of an extra orange. It gave the cake a cheek pinching sourness that was balanced by the honeyed mascarpone. This is worth a try if you like sour lemon flavours. Another variation to the original recipe is to pour warm chocolate ganache over the cooked cake, giving it a jaffa flavour. 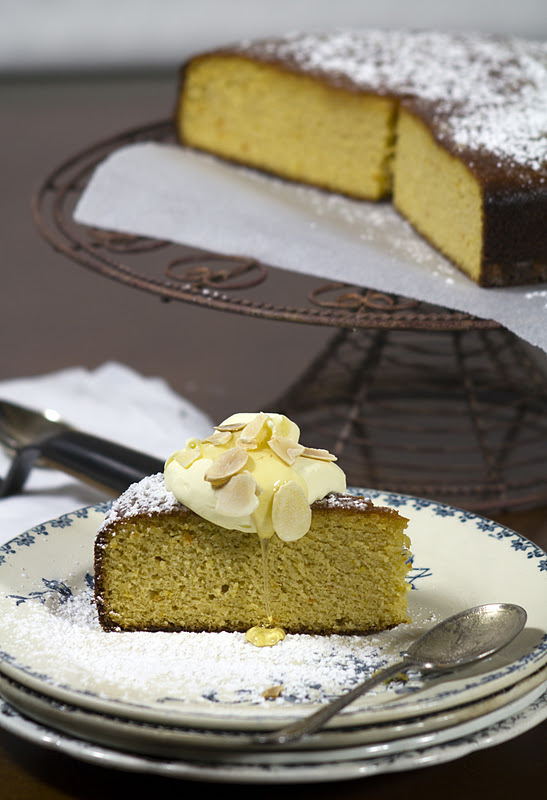 The cake is great served warm or cold and is absolutely perfect with mascarpone, honey and almonds. It really is a wonderful cake to take to any occasion and its citrusy flavours makes it an ideal festive cake. It will appeal to the gluten intolerant and those watching their carbs, just watch out for the mascarpone that goes with it. Wash the citrus fruit and cook unpeeled in a pot of boiling water for 2 hours. Drain the water, allowing the fruit to completely cool. Do this ahead of time. Preheat the oven to 180C and grease and line the base of a 20cm spring-form cake pan with baking paper. Break the eggs into a food processor or blender, add the 250g of caster sugar and blend together. Over a bowl, break up the two cooled oranges, removing and discarding any seeds. Place the oranges including the juice and skin into the egg mix in the blender. Blend together to a smooth consistency. Add the almond meal and baking powder and blend again till smooth. Pour the cake batter into the greased pan and sprinkle the top with the extra caster sugar. Bake for about 1 hour to 1¼ hours until the cake is golden brown. Remove the cake from the pan when cool. Dust with icing sugar to serve with a dollop of mascarpone, a drizzle of warm honey and roasted, slivered almonds.